As you know, counterfeit parts are becoming more prevalent in our industry. These parts cause problems from production shutdown to product failure. The best way to receive genuine parts is to purchase them through authorized sources. Customers buying from authorized corporations registered with the Electronic Components Industry Association (ECIA) can be assured that purchased products are of the highest quality, adhere to all government and industry standards and regulations, and that they will stand behind their product. The product has been purchased through government QPL’ed , government inspected and audited facilities and sources. All Powell Electronics product has our proprietary mint mark and the factory markings displayed with epoxy laser ink. The product has been handled and stored in accordance with industry quality standards. In addition to our warrantee, the component manufacturer’s warrantee will be passed through to you. 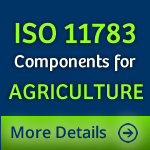 Documented traceability to the original manufacturer is available for seven years, including lot and date code. Powell has signed distributor agreements with all our factory sources. We have access to our supplier’s full range of up-to-date technical and product information, as well as technical support. We maintain and audit an ISO documented vendor list. The Electronic Components Industry Association (ECIA) supports the expanding needs of and interests of the global supply chain. Made up of members representing companies of every size and every sector of the electronic components industry, the ECIA provides a voice for their affiliates on vital issues to the electronic component supply chain. Committees within ECIA develop and maintain global standards and guidelines for the industry, assuring the delivery of quality product to international customers. The ECIA also promotes the industry as a whole, researching new processes, offering support and advocacy services for members, and helping the industry move forward successfully. For more information, visit ECIA online at: www.eciaonline.org. We encourage our customers to establish internal controls to make sure that parts are purchased thought supplier authorized distributors. It has been our experience that most counterfeit products are the result of end customers like Raytheon procuring from unauthorized, non QPLed entities.